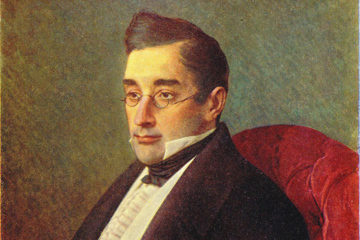 “Never in my life there has been any experience to meet, in any nation, a person, who might so ardently and passionately love his motherland, as Griboedov loved Russia”, - Faddey Bulgarin spoke of his friend, whose activities enormously influenced the development of the Russian culture. Later on the author of immortal comedy “The Mischief of Being Clever” will say: “The more educated a person is, the more useful he is to his motherland”. Precisely the ardent patriotic feeling for Russia went with Aleksandr Sergueevich Griboedov during all the dynamic and turbulent life of “one of the most intelligent persons of Russia” of the nineteenth century, as it was expressed by A.S. Pushkin.